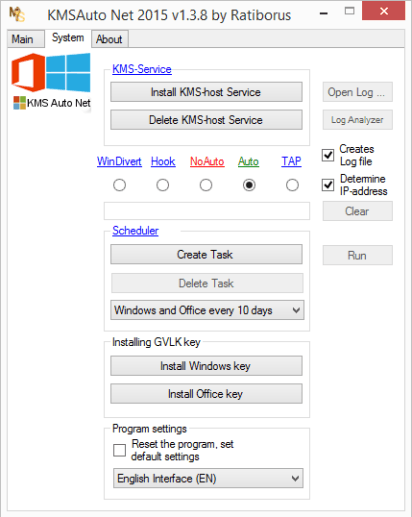 KMSAuto Net — the automatic KMS solution to activte the following operating systems Windows Vista, 7, 8, 8.1, 10, Server 2008, 2008 R2, 2012, 2012 R2 also for Office 2010, 2013 VL editions. It is based on KMS Server Service from mikmik38 (MDL). 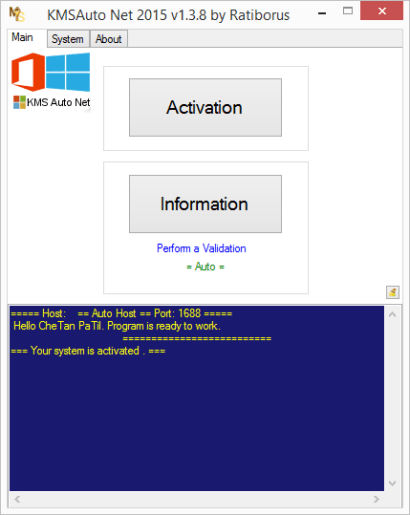 Run KMSAuto Net.exe as administrator and use the interface. If you need additional program features, enter into Professional Mode. The On/Off Professional Mode button is placed in the «About» Tab. To activate via LAN, the TAP interface can't be used to install and activate through an address of a computer in the network. To run properly, it is necessary to add the file KMSSS.exe in the exclusion of your Anti-Virus! Or disable Anti-Virus at the time of activation. Sometimes KMS-Service is not installed properly, it may be for different reasons. You need to perform 2-3 times «Removing KMS-Service» and restart your computer. Added new GVLK keys for Windows and Office.